Salads are the easiest of 30 minute meals. 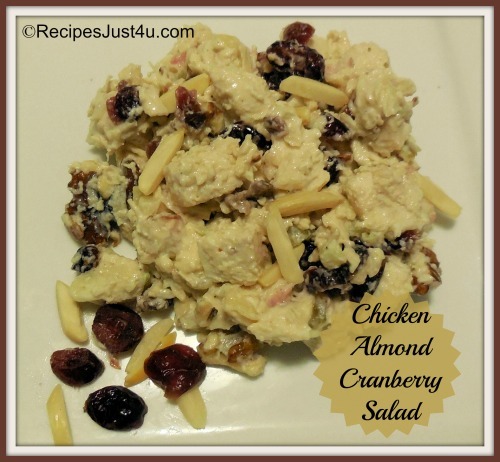 One bowl, a few minutes and you have yourself a delicious chicken cranberry salad with nuts. Making this chicken cranberry salad is a cinch! 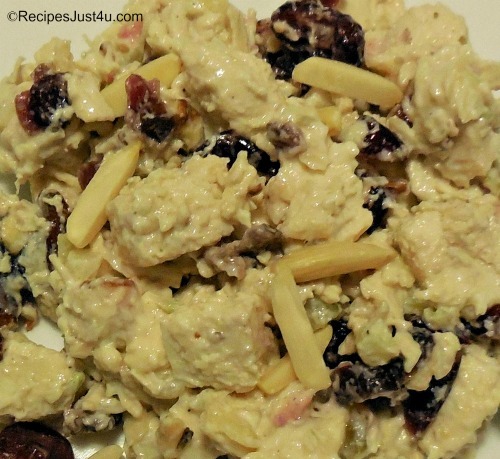 This salad combines left over chicken with the tart taste of dried cranberries for sweetness. Walnuts and slivered almonds give some extra protein and a nice crunch. Then the whole salad is wrapped up with a home made dressing that features tarragon vinegar, mayo and some salt and pepper. The taste is amazing. It’s sweet and tart and crunchy. Good thing it is ready so quickly. You will want to have it often! Combine the mayonnaise and tarragon vinegar and mix well. Mix the chicken, walnuts, 2 tbsp slivered almonds and cranberries in a bowl. Add the dressing and mix to combine. Season with salt and pepper.